How to Be a Werewolf - Putting on moves. Vote over at TWC to see the thumbnails from this week's pages, and also because it'll make me happy! I stubbed my toe today, so I need cheering up. A lot of my thought in this page went towards trying to avoid using the word "neat!" like, five times. Because that's my go-to phrase for just about everything, and I don't think about it anymore. So, we've ended up with "bees knees", which is also excellent and I need to use it more. Marisa's magic is primarily blue, and Charlene's is primarily pink. I like to think that this isn't a hard and fast rule so much as it's a preference. Charlene's illusion from the forest in chapter 4 wasn't pink, because those pages were in black and white, but regardless, I don't think pink would work in that situation. And her crow is real, so it's not pink. When she says that she feels like the visions are a different type of magic, Charlene is a witch, but she's also got a whole "third eye" psychic thing going on. This is how she communicates with her crow, who I need to feature again. It appeared in the last chapter, but didn't do anything. Side note, my dad had pet crows when he was growing up, and they are apparently super cool and very friendly if you hand raise them. Unfortunately, his dog ate them. That wasn't a fun story. Moving on, let's shift gears and finally set up the rest of this chapter, because Marisa is here! Finally! I'm a fairly methodical writer, so if you've noticed that the beginning of most chapters set up whatever's going to happen later, step by step, you win! I guess that's usually the point, though, unless you hate structure. (I love structure.) 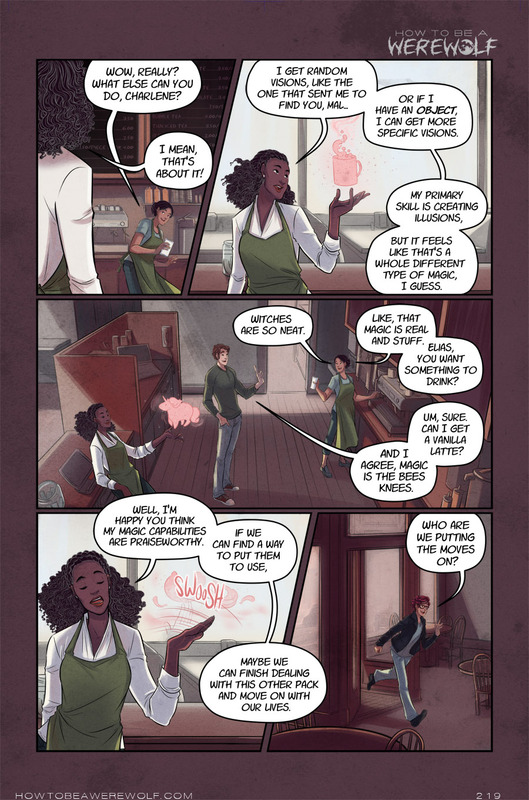 So far, if you've guessed that Charlene's magic is going to be important, Elias's weird pack issues will keep popping up, and that this chapter is going to feature Marisa as a main character (seeing as her and Marin are on the chapter cover), then you win! Anyway, I'm out of town for a long weekend visiting my aunt in Mississippi next week, so I gotta plow ahead on the next two weeks of pages! I'm ahead, but I need to be MORE ahead. Frankly, I need to be waaaay ahead in general, but I have a hard time maintaining a buffer, not out of laziness, just because it doesn't seem to work well with my writing process :|.